Picture it: Your ideal customer, the person you work so hard every day to serve, has found your site, made just the right selection, and clicked that magic button, Add to Cart. And then…they just walk away. Perhaps never to be seen again. Whether you know it or not, this is happening to you. Do you know how much money you lose to abandoned carts every quarter or year? If you did the math, you would probably be shocked. Despite the rise of online shopping, with 96% of Americans having made a purchase online in their lives, as reported by Big Commerce, it seems that just as many people are ditching full shopping carts without making a purchase. Nearly 70% of shoppers have abandoned their carts, according to Baymard Institute. This is how you lose money—and the chance to earn new customers. But it doesn’t have to be your fate as an online retailer. You can improve the percentage of people who actually buy. Baymard also found that there are $260 billion dollars that are recoverable through improving your checkout process. There are many ways to get your shoppers to complete their purchases, and below we share five data-backed ways to take cart abandonment into your own hands. With Amazon Prime hitting 66 million members, every online retailer now must consider free shipping as a way to convince shoppers to purchase with them. Advertise free shipping with a banner ad at the top of your website and various other pages, and make sure it’s clear to shoppers throughout the path to purchase. NuFACE, a skin care ecommerce website, increased orders by 90%, with a 96% confidence level, using the free shipping tactic. During the testing process, as reported by VWO, half the visitors were shown their original page, while the remaining shoppers were directed to a new page that said, “Free Shipping Over $75!” In the end, they also boosted their average order value by 7.3%, making this a win-win option. Not all consumers are ready to buy right away, but that doesn’t mean they want to abandon the purchase. In many cases, they’re just waiting for a paycheck to come through or need to make space in their budget. In this case, to decrease cart abandonment, allow shoppers to save the items for a later purchase and then use targeted emails to remind them of the items waiting to be purchased. Highlight: Use of the words “Limited quantities.” This implies urgency. Highlight: Simple, funny and on-brand. Highlight: Large, clear CTA right at the top. In addition to creating an email flow for users who abandon their carts, take it a step further by keeping their cart or shopping bag visible in the top navigation. If they return to the site for something else, or continue browsing around, this serves as a reminder for them to make that purchase. With so many name brands dominating the online shopping revolution, consumers are hesitant to purchase from smaller, lesser-known retailers. That hesitancy can easily lead to cart abandonment if you don’t show them that you’re trustworthy—even if they don’t know your brand just yet. Make sure your trust labels are on every page in the checkout process, especially where you’re asking for their personal and credit card information. You can also include them at the bottom of your site, just below the footer, especially if you’re strictly an ecommerce site. As with anything on your site, test placement of the trust labels and track the results. One location is likely to increase sales more than another, and when you find that sweet spot, you’ll also likely see a downturn in cart abandonment. Including steps in your process that are seemingly unnecessary can spook potential customers. It could be anything from requesting a phone number to an email or password entry. Though you may require this information, it may not seem necessary to a shopper who then abandons your cart out of fear and uncertainty. Provide an explanation on forms: Provide pop-up boxes in places where you’re requesting a phone number, or any field that may seem unnecessary to the shopper. Upon hover, the text may read: We need your phone number in case there’s an issue with your order. Keep testimonials close by: Remind consumers that other shoppers have had pleasant experiences with your business by including key testimonials throughout the purchasing process. This could include testimonials about ease of purchase, speed of shipping, and helpful customer service. Consider what concerns your customer would have and then quell them with a testimonial. Don’t forget small details: Consumers are deciding whether or not to make their purchase right up to the moment they hit buy, which means every little detail can make or break the sale. 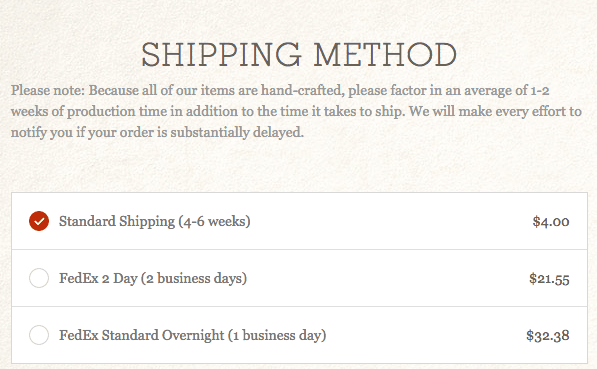 For example, Tommy Walker, author for the Shopify Plus blog, points out that one brand doesn’t include all the details on shipping time, as you can see below. He explains, “By altering the copy to add just a little more clarity in the ‘Shipping Method’ section, the visitor has all of the information necessary at the point of decision, and therefore can trust themselves to make the right choice given their circumstances.” See his altered image below. What other small details are you leaving out? Go through your purchasing process with a critical eye. Question every step, compare to other big names in the industry, and modify as needed. While checkout is a great place to collect data about your customers—email, phone number, address—it’s also a place where you can easily deter shoppers from making their purchases. If you ask for too much information, they may be weary (or too lazy) to share it, and will opt for another place where the order process is easier. The goal is to make their lives easier, and this is one of the quickest, and most effective, ways to do that. In some cases, simply asking them to sign up for an account later in the process may even decrease abandonment rates. ASOS removed any mention of new-user account creation from the first page, and instead requires this step after users have clicked “Continue.” The page is also labeled as “About you” in the flow navigation, which may also help psychologically, making it feel more like completing a profile rather than having to enter information customers don’t want to share. If you’re still worried about deterring shoppers, or have tested this and saw no success, you can prompt customers to create their accounts after the purchase has been made. You can even fill in whatever minimal information you’ve already acquired (name and email address, likely) so it looks like less work to the shopper. Unbounce shared a case study of the company Strangeloop, which tested page speed to get quantifiable results. The first test, with Group #1, served visitors with a fully optimized set of pages, and at the end of all five steps, nearly one third had completed their purchases. Group #2, however, was served with a two-second delay on the first transaction page, and the results were as follows: only 2 out of 15 users completed their transaction, for a 60% cart abandonment rate. Unsurprisingly, introducing this same slow down midway through the purchasing process still caused a drastic drop-off, with 3 out of 15 users completing the transaction. If this isn’t your forte, pass the optimizing work off to a freelance developer, who can likely tackle many of the fixes in just one afternoon. If you have an in-house developer, you’re in even better shape to make changes quickly. Cart abandonment is an issue that all retailers, small and large, deal with. You don’t have to let this be a problem for your ecommerce site, though. Instead, use these ideas to encourage shoppers to complete their purchases. Consider all possible avenues to reduce cart abandonment until you see a significant decrease—then remember to test and optimize however possible. Have you used any of these tactics to reduce cart abandonment? Tell us about your ideas, what’s worked and what hasn’t, in the comments. Jessica Thiefels has been writing for more than 10 years and has managed a number of employees in her various roles. She now owns her own consulting business and has been featured on Forbes and Business Insider. She regularly writes for StartupNation, Manta, Contactually and more. Follow her on Twitter @Jlsander07 and connect on LinkedIn.